"Fantastic bars that have a lot of flexibility. You can adapt the recipe to your liking. Great for hikes, long road trips and camping as they store well and keep fairly long - unless you eat them all! 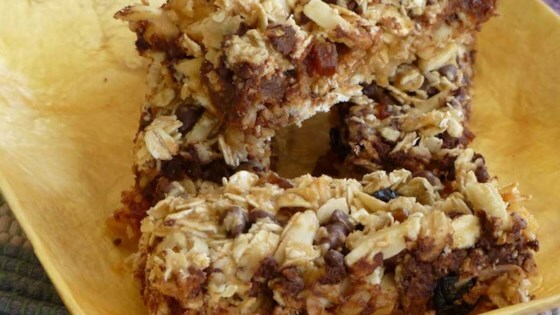 Use any combination of chocolate chips, dried fruit, coconut, pecans, almond slices, or any other tidbits you'd like in a granola bar." In a large bowl, mix together the oats, sweetened condensed milk, butter, coconut, almonds, chocolate chips and cranberries with your hands until well blended. Press flat into the prepared pan. Bake for 20 to 25 minutes in the preheated oven, depending on how crunchy you want them. Lightly browned just around the edges will give you moist, chewy bars. Let cool for 5 minutes, cut into squares then let cool completely before serving. Perfect to pack for a hike, a camping trip and a long road trip.